Liver Cell Cancer focuses on liver cell cancer, which is considered one of the most aggressive malignant tumors, and in turn, one of the most intensively studied tumors in man and experimental animals. This book discusses the geographic pathology, alpha-fetoprotein, diagnosis, treatment, and background of liver cell cancer. 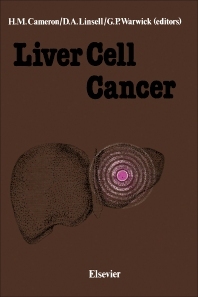 The clinical problem of liver cell cancer in a high incidence area; primary hepatocellular carcinoma; induction of liver cell cancer by chemicals; cell proliferation and experimental liver cancer; and immunology and pathology of experimental liver cell cancer are also discussed in the chapters. This book aims to provide a ready reference for clinicians for research, present a clear and unambiguous picture to research workers of the problems inherent in the clinical situation, and introduce a reasoned assessment of the findings, both clinical and experimental. 10.4.5 Which changes are intimately involved in transformation to liver cancer? 10.4.6 What new important biological properties do cells acquire during liver carcinogenesis?